If you are in search of the unusually beautiful creations of famous bridal fashion designers, maybe the creations of Basil Soda wedding dresses will satisfy this need. In fact it is not necessarily unusual, but rather something that western civilizations haven’t yet come in contact with because it is all about elements of Lebanese tradition combined with contemporary touches of the nowadays fashion trends. The Lebanese fashion designer has an incredible instinct in sensing femininity, reflecting this in his bridal creations. With him, you can say that new trends can be set for the bridal fashion regardless which year we are in. Even if you take a look at his creations from previous years, you will find Basil Soda wedding dresses coming as a breeze of novelty, fascinating inspiration and can easily say that these past creations can become trends of the current year. With the 2009 collection, Basil Soda has presented stunning wedding gowns inspired by pastel colors and the fresh beauty of flowers of the early spring season. For the 2010 the bridal apparel catwalk brought in elegant creations with gowns embellished by sequins applied on luscious fabrics in colors of peaches and whites. 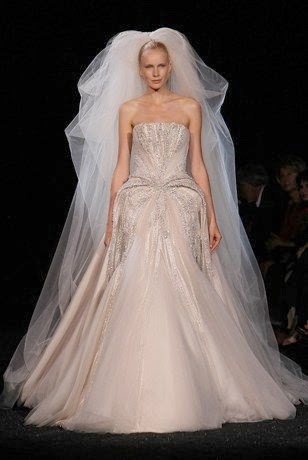 Copper and gold were other two favorite colors to complement the haute couture collection of Basil Soda wedding gowns. There is the architectural design encompassed in his creations to reveal a bold contrast of heavy structures against soft and curvy lines of a woman silhouette. Asymmetric construction is another feature that one can distinguish in Basil Soda wedding dresses collections with details that shimmer in the limelight of the famous fashion catwalks. Elements of ancient styles (the Grecian goddess style) feature beautiful draping emphasized by shiny trimmings while cool silver comes with hot styled gowns to confer a specific freshness to the overall bridal image. For 2011, Basil Soda wedding dresses combine organic elements with shapes that come from the future featuring heavily embellishing pieces for the bridal neck. Color plays again an important role and addition to his asymmetric structure while elements of pleated shoulders and encrusted bodice bring a new effusion of uniqueness and incomparableness. Thus we find pale blue combined with beige, sea foam green and cornflower blue, collared dresses with floral details – all these being merely a few new features introduced by Basil Soda in 2011 bridal collections.